Update 2/23/2014. I was in India from Oct. to Nov. 2013. The external hard drive in which many of my files were stored broke. I didn't get them backed up onto another storage device before the accident and lost many files. I'm waiting to hear back from a company in Florida on whether or not they can retrieve my files from the damaged disk. Some of the pictures here are the only copies I have. Of these, the higher resolution ones were on the damaged hard drive. I may have to redo them from scratch if I can't get them through file retrieval. I tried to retrieve them using retrieval software, but they were overwritten. Digitally modified Colored pencil sketch. These were my thoughts early on: I might replace the crystal/glowing orb with a raven or crow. Still in developmental stages. Crow woman. 3/16/2014. Just prior to the Crow Moon, without realizing it, I must have tuned into it and this ended up including the crow as a main element. 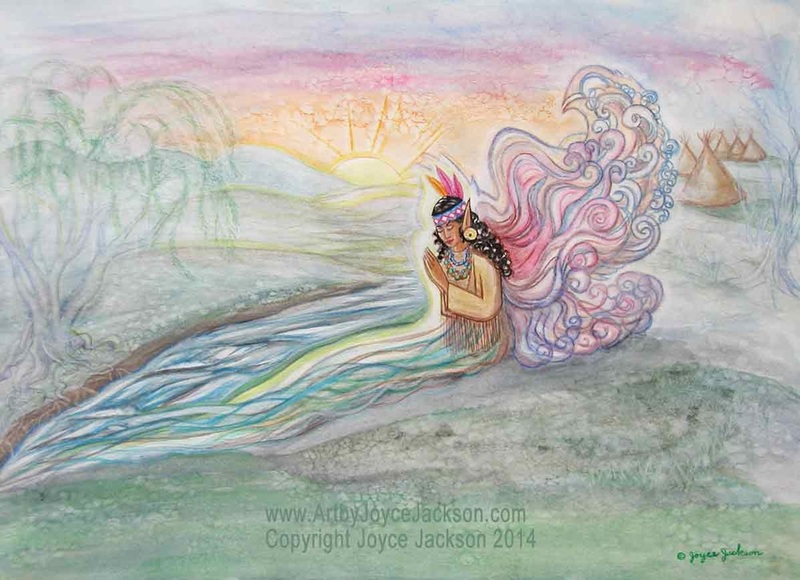 Native Woman River Fairy. This is a mid-stage digital version. I was using it to work out how I wanted details to look when I hand painted it with watercolors or acrylic paint. Pics of this were also lost. I'll hand paint it and create new high res pictures from that. An early stage. Concepts with a bit of detail. Colored pencil sketch. After many modification phases, Sitting Fairy was transformed into Crow Woman. Now she just needs to have crow eye color changed to dark brown. This is the only picture I currently have of the final stage of Owl Woman Fairy. (I'll create new photos to replace the lost high res pics of this that were on the broken HD.) I plan to expand its vertical dimension. Latest work. 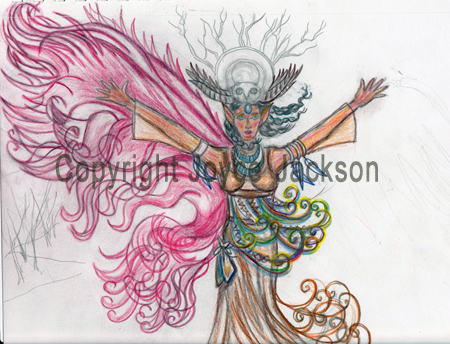 This is a color test done with colored pencils on an inkjet printout of the scanned pencil sketch. It was used for deciding on choice of colors before doing it with watercolor paint. A preliminary sketch of this was first done for an Ellen Million Sketch Fest. The rules are to create a sketch from a prompt within an hour. 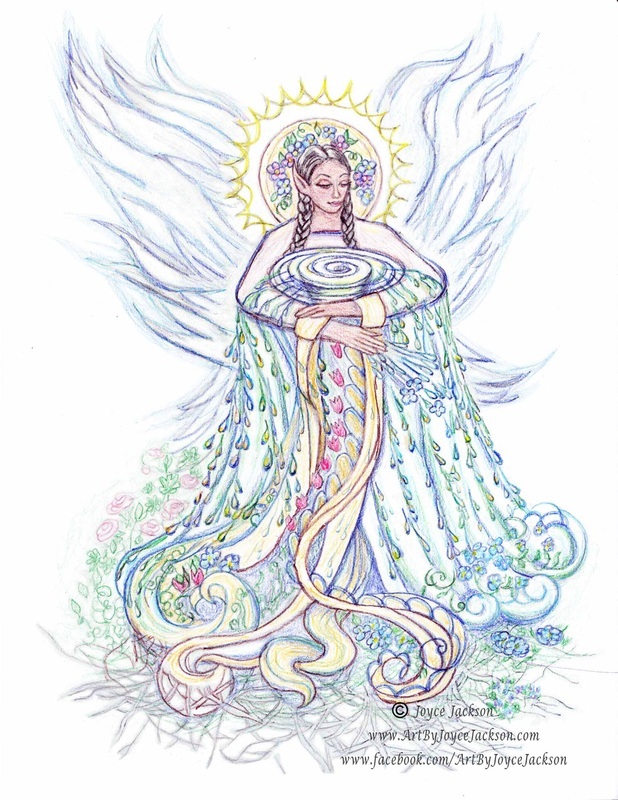 The prompt was given by Coriander Shea, administrator for the Enchanted Visions project, aka EV. 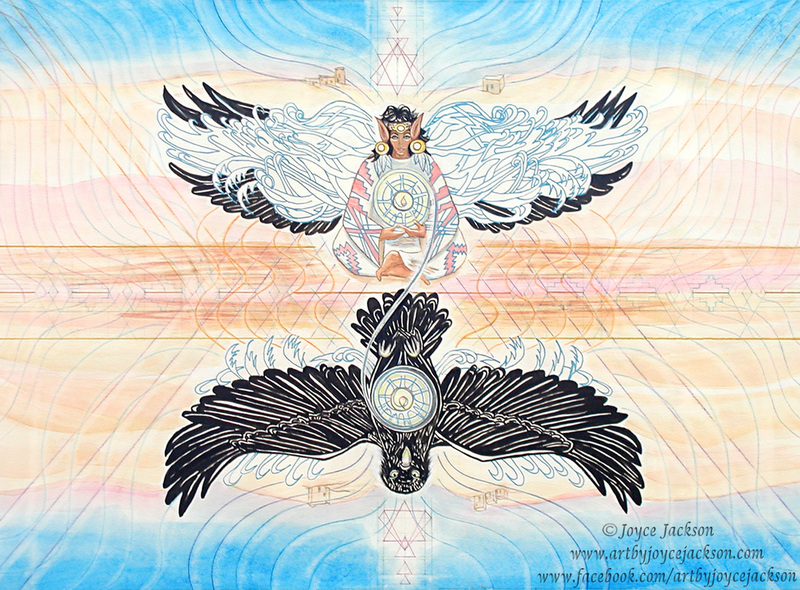 I was unanimously voted into the Enchanted Visions project shortly after submitting images of my work to the EV board for jurying. 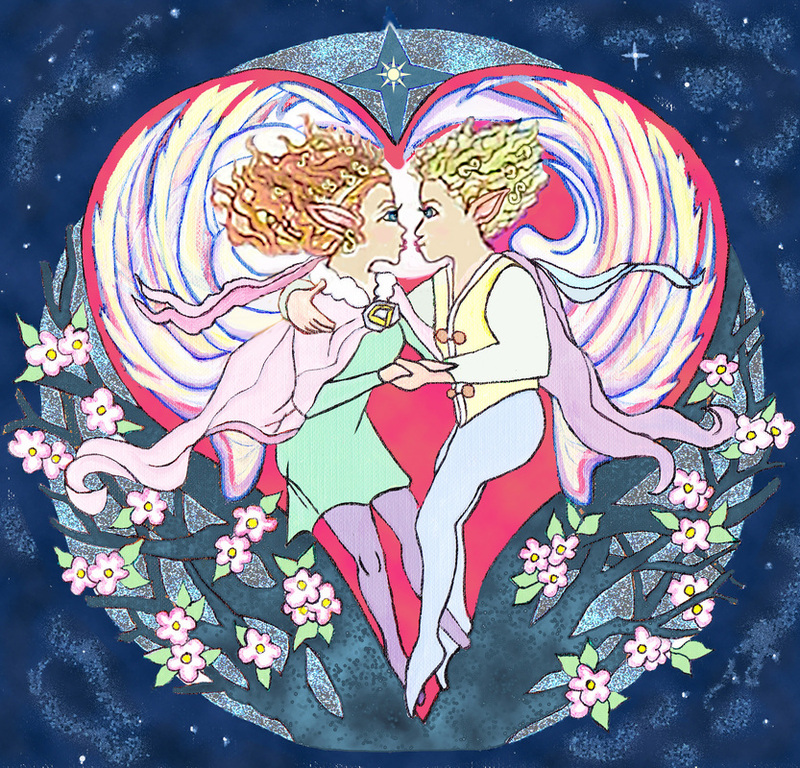 EV is a group of prominent fantasy artists who have joined forces primarily to promote their work and to create artwork based on monthly themes. 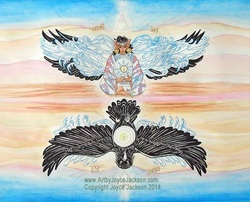 They also have a Facebook fan page, and offer their artwork up for sale at Facebook Monthly Fantasy Art Auction. Same as previous, except it has a transparent white layer over it. Opaque with check layer over it. Made transparent. No check layer over it. Not yet fitted to check. Side decoration will be added to fit check dimensions. Shown with bright colors. Colors can be muted or overlayered with transparent white. An early stage graphite and colored pencil sketch. It started as my entry in the most recent Sketch Fest on graphic artist Ellen Million's web site. Acc. to the rules, artists have only one hour to create a sketch based on a Prompt given by someone else. The artist can choose from among several Prompts. 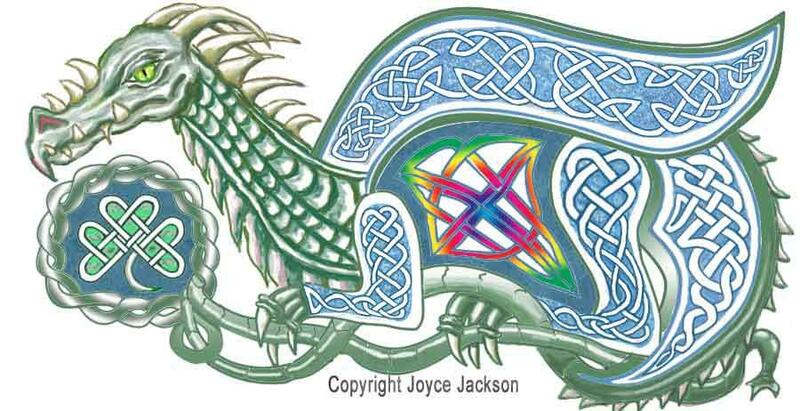 I chose this one, Celtic Dragon, because it fit with what I'm trying to create for the checks. 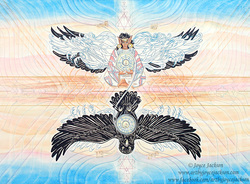 An even earlier stage of it is shown on my ArtMUSE-ings blog. The .psd's of this were also lost with the HD breakage. I'll create new ones. 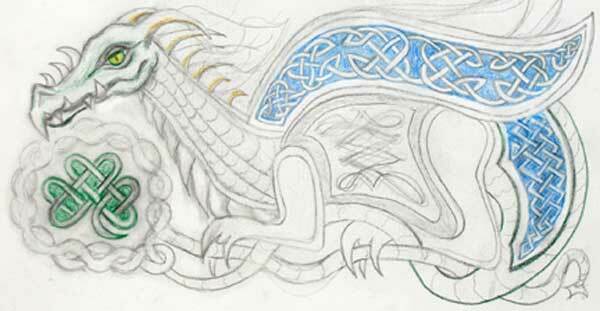 More dragons are in the works. Dale, here's a contact form for your convenience. What do you think so far? Your comments are appreciated. Thanks! 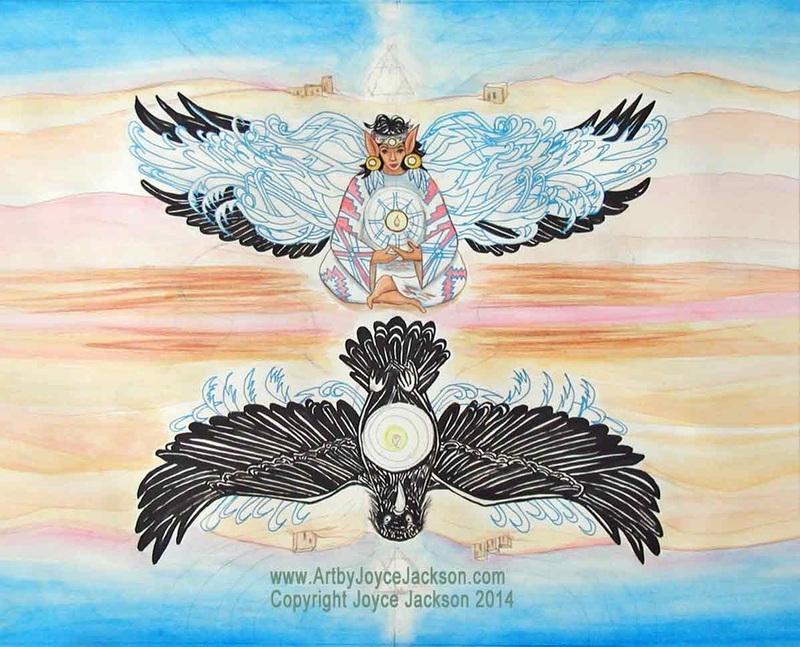 All content on this page, whether graphic or text, or other form, copyright Joyce Jackson. All rights reserved.